It's taken me a few years experimenting with makeup to learn just how crucial good brushes are, but I have recently tried to pay more attention, and slowly acquire a collection of good, reliable brushes. Of course, when tarte announced that they were releasing these limited edition unicorn-themed brushes, I had to get them! Tarte has impressed me so far with everything I've tried from them (their skin care line has some of my favorite products), so I knew these would be a great addition to my collection. 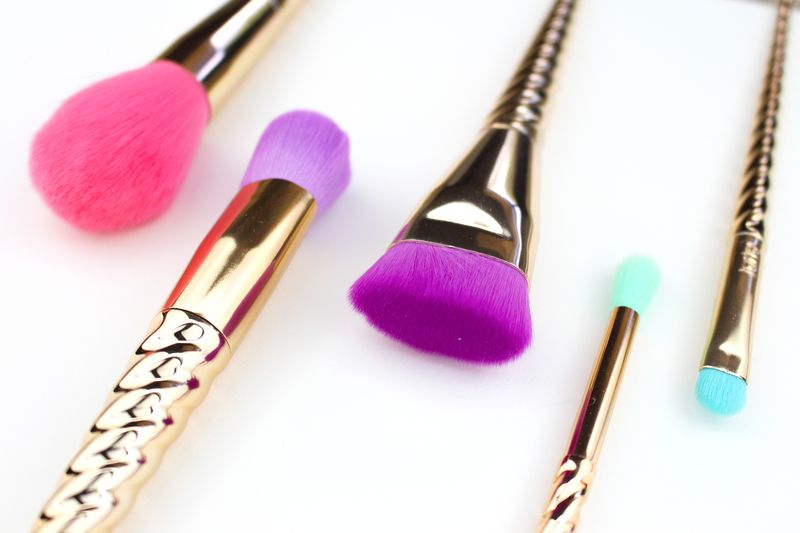 The set includes five brushes: a foundation brush (purple), a contour brush (magenta), a powder brush (pink), an eye shadow brush (blue), and a blending brush (green). The handles are design to resemble unicorn horns, in a (very!) shiny gold finish. Hopefully the pictures make this obvious, but upon first impressions, the most noticeable thing about these brushes is that they are gorgeous. There have been a few companies creating similar designs, but what I like the best about tarte's design is how luxurious and sophisticated they look -- it might be unicorn inspired, but this is by no means a Lisa Frank brush set! The color choices for the bristles are fun and girly, but the gold handles really bring an air of class to the design. My second impression is that these brushes are some of the softest ones I own! They rival my current favorites (a set of Sephora brand brushes.) The pink powder brush specially feels like it will be a treat to use, and it's definitely the softest powder brush in my collection. I'm looking forward to trying these out, since my first impression of them is so positive, and they look very promising. The contour brush is the one I'm excited for the most, since I (gasp!) didn't own a proper contour brush yet. 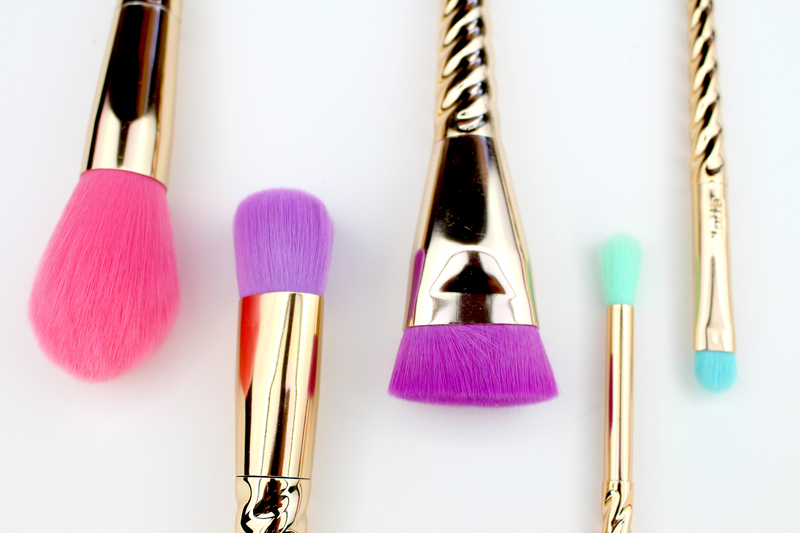 The Magic Wands unicorn brush are available on the tarte website. FTC: The products featured in this post were not sent to me for review, nor have I been compensated for featuring them. All opinions are my own, and my views do not reflect the views of the companies whose products are featured. Read more about how OhHiAndie.com complies with FTC guidelines.